Enjoy ultimate comfort even in the coldest weather with our highest efficiency gas furnace product. It features industry-leading modulating gas heat performance that delivers our ultimate levels of temperature control and quiet performance. The variable-speed blower also means you’ll enjoy better summer dehumidification and a possible SEER boost as your furnace works with your cooling unit to help pull moisture out of the air. Pair it with a compatible air conditioner for full fuctionality and a full communicating system using the Observer® communicating wall control. The ENERGY STAR® qualification assures you of energy-saving performance year after year. Stay out of the cold and keep warm with our high-efficiency gas furnace. Its reliable two-stage delivery and variable-speed blower provide enhanced temperature control for your comfort. The variable-speed blower also means you’ll enjoy better summer dehumidification and a possible SEER boost as your furnace works with your cooling unit to help pull moisture out of the air. Pair it with a compatible air conditioner for a full communicating system using the Observer® communicating wall control. The ENERGY STAR® qualification assures you of energy-saving performance year after year. 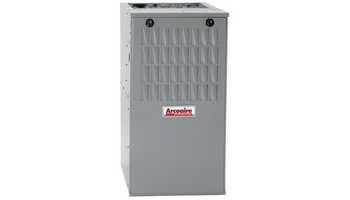 DuraComfort™ Deluxe 80 Gas Furnace,Keep the pesky cold out and the comfort in with our efficient gas furnace. It features a variable-speed blower motor and two-stage gas heat performance that together deliver temperature control and quiet performance. The variable-speed blower also means you’ll enjoy better summer dehumidification from your cooling unit, and you might even get a SEER boost as well. Pair it with a compatible air conditioner for a full communicating system using the Observer® communicating wall control.